Dried apricots, peach, currants, milk chocolate, sherry, a light sour note, a mild soapiness (lavender), earl grey tea, some clove and a whiff of aniseed. Sherry, sweet and sour white wine, apricots, bitter oranges and mild cocoa, also some peppery spiciness and quite tannic. Medium length, mainly bitter tea, tobacco and tannic like wood spices but nothing too astringent. oranges, fruit tart, slightly nutty, hints of parsley. white dessert wine. nicely balanced. 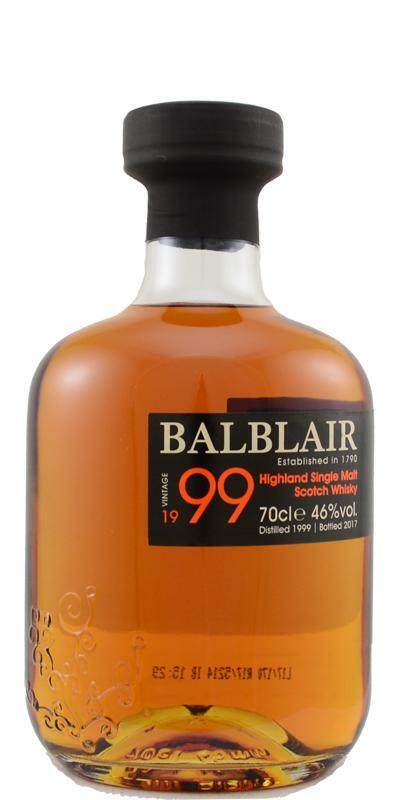 AppearanceThe third release of Balblair Vintage 1999 is polished copper in colour. AromaThe aroma is intriguingly spicy with a warming layer of soaked raisins. Seasoned fruit cake and oily orange peel perfume the mid tones with elegant energy. Understated chords of green apple and creamy vanilla custard follow while a hint of leather adds darkness and weight in an impeccable balancing act. PalateOn the palate mature chocolate and toffee sweetness forms a firm and rounded base for the complexity of dried fruits, ground exotic spices, fragrant orchard and set honey. FinishFlavours cascade richly into the long and rewarding finish with gingerbread spice and autumn fruit galore.